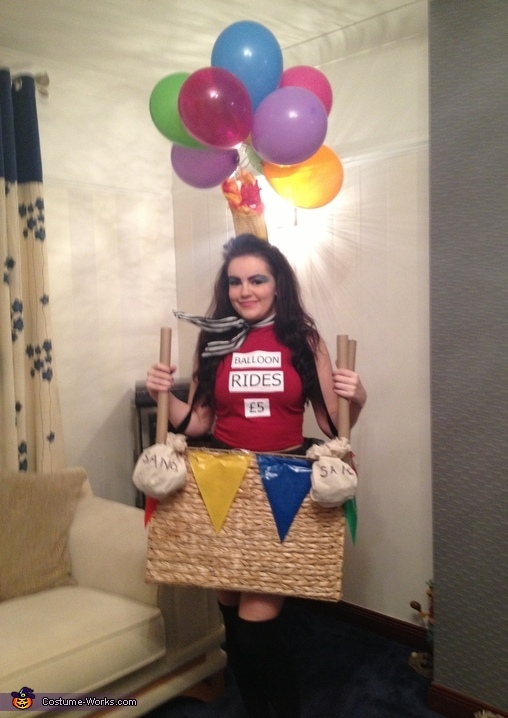 Following the success of "Up" I got the idea of doing a hot air balloon costume. I started with a wicker basket from a discount store and cut the bottom out of it. I added bunting and sandbags to make it more authentic. I attached it to my body with one big luggage strap around my neck and then attached the helium balloons to the back so they were above my head. For accessories I used a headband and attached orange and red crepe part wrapped in gold foil so it looked like the fire burner under the balloon. And as a comical element I got the Tshirt made to advertise balloon rides.